Calusa Written accounts by Spanish missionaries, shipwreck survivors, and chroniclers help us to imagine the Calusa people who built and lived upon the massive artificial shell constructions of southwestern Florida. The cultural traditions of the Calusa were deeply rooted in Estero Bay, Charlotte Harbor and neighboring areas. Major archaeological sites are characterized by their large size, and a diverse arrangement of shell mounds, sand mounds, shellworks, canals, and other features, and include places like Useppa Island, Pineland, and Mound Key. These were major towns—centers of political, economic, and religious power—though evidence of aboriginal occupation is abundant on the landscape, and includes a host of family camps for shellfishing, fishing, and other procurement activities, as well as satellite communities. Archaeologists have documented nearly 80 ancient archaeological sites within the boundaries of the Charlotte Harbor Preserve State Park—with many more in the surrounding area. 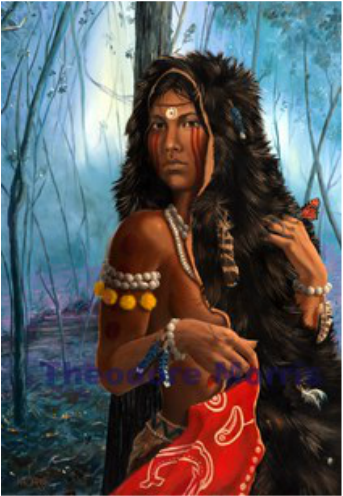 Relying on aquatic resources, the Calusa developed into a powerful, tributary chiefdom prior to the arrival of the Spanish in the sixteenth century, and occasionally expanded their reign to include other southern Florida tribes. The Calusa strongly resisted two Spanish mission attempts—one in 1566 and another in 1697—and persisted in many of their traditional ways into the eighteenth century. In fact, Juan Ponce de Leon mentions a hostile encounter with the Calusa in 1513 and was fatally wounded by a Calusa arrow in 1521. Despite their resistance to Spanish control, the Calusa participated in an extensive exchange in European goods, which were introduced through shipwreck salvage and trade, frequently incorporating these items into traditional exchange networks, and added to patterns of costume and adornment. In 1566 Pedro Menendez de Aviles described a town of 4,000 men and women and the chief's house on the highest mound that held 2,000 people. My use of a dramatic colorful sunset represents the tragedy that is about to befall the Calusa people with the arrival of the Spanish. I have Carlos gazing directly at the viewer in a confrontational manner. Wolves are used in the mythology of nearly every Native American tribe. They are associated with courage, strength, loyalty, and success in hunting. Wolves are also the most common clan animals and like bears, they are considered closely related to humans. I painted the canvas using warm colors contrasted with cool colors. The man's face is created by using very warm pigments as contrasted to the wolf, who has cool colors. This produces visual movements. Priests wore masks described by Spanish Jesuits in 1567 as "horrible," which were kept in a temple built on top of a special mound. 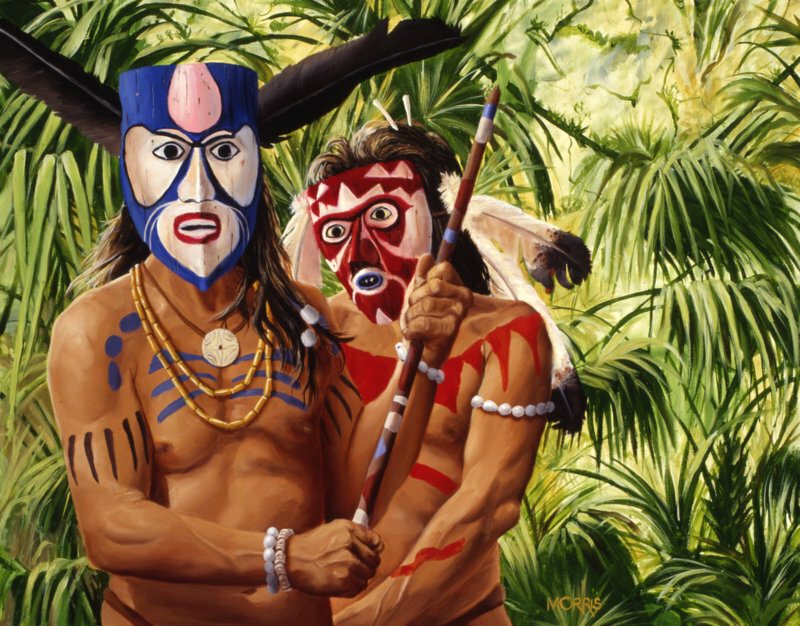 Although the masks played an important role in the Calusa culture, their exact purpose is not known. I painted these priests immersed in their lush subtropical environment. "The Indians go to where the dead are buried and talk with them and ask heir advice. I believe it is actually the devil who answers them, because the dead tell them about real events that occurred in far away places and things that actually happen in the future." Following a warm summer rain, two girls prepare for a tribal ceremony on Florida's lower west coast. The older girl is holding a wood figurine which may have had religious significance. The younger girl is playing with her sister's bone hairpin adorned with Hawk feathers. It was the custom of the Calusa chief to have more than one wife. Marrying a woman from outside the Calusa tribe insured peace between these other tribes. I used the blue background along with the mysterious forest to convey a sense of drama. She wears all her splendid finery to impress her new husband. This young woman, who has adorned herself with body paint that signifies that she is a member of royalty and has put on her finest jewels, prepares for a feast by gathering hog plumes in a carved wooden tub. The lifestyle of the Calusa was leisurely, and they enjoyed numerous celebrations and feasts, many of which were connected to religious ceremonies at which lavish meals were prepared.
" These people are able to sustain themselves solely with the abundance of fish that they catch and some wild fruits." After coming down from a mound temple, this high Calusa priest prepares himself to participate in a secret ceremony. The masks were representative of the mystical, compelling, and sacred powers believed to be possessed by these important principle men of the Calusa culture. The design of the masks were taken from actual masks recovered during the Frank Hamilton Cushing expedition in 1896 at Key Marco, near Naples. "...by their conversation, I discovered that baptism was not lawful for them,--they were heretics; andsince then it appears they have returned to their old ways, and are more wicked than they were formerly." This painting shows a sacred wood carver suddenly looking up to confront the viewer while his daughter looks on. He sits on the shore at Mound Key which is located in Estero Bay just south of Ft. Myers. By painting all the materials needed to carve these beautiful spiritual items, I have connected the relationship between their environment and their culture. 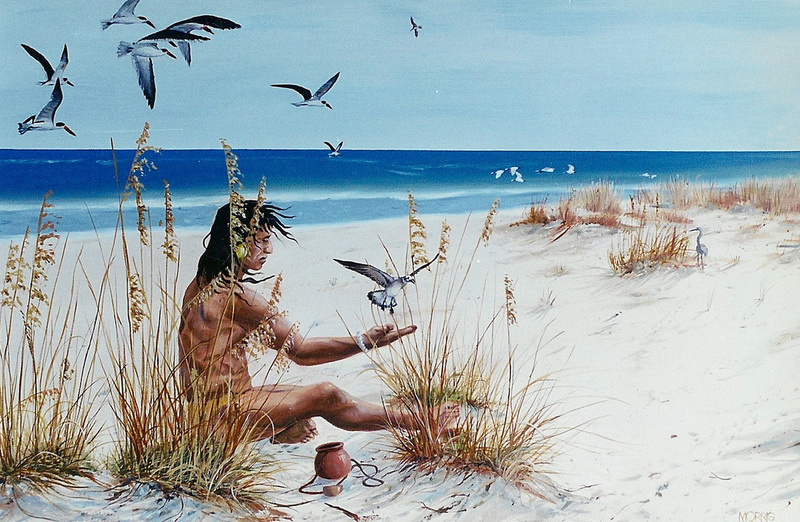 The painting is the main focus of a video produced by the Florida Anthropological Society. The Calusa believed that there were three gods who ruled the world. The greatest and most powerful god controlled the weather, sun, moon, and stars. Elaborate carved wood masks were part of Calusa pageantry. To emphasize the strength of this Shaman, I placed him in bright sunlight in contrast to the dark squall line approaching. 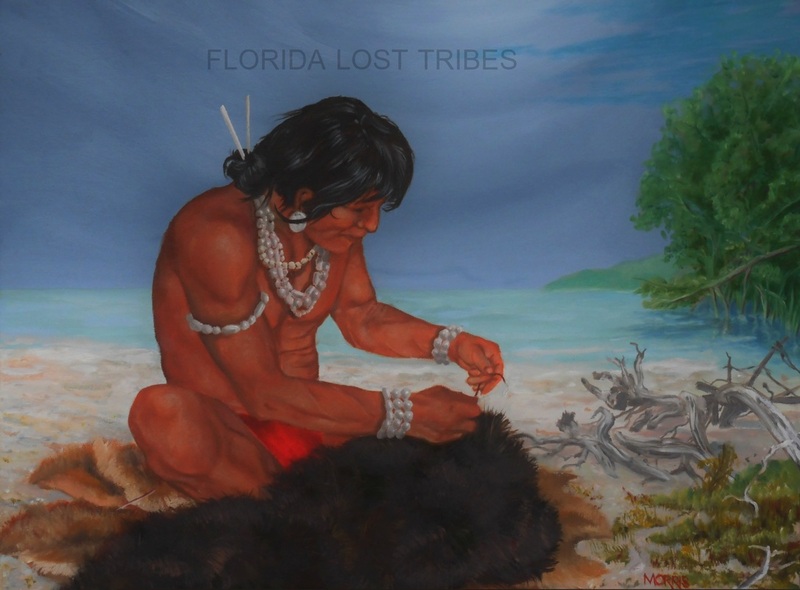 The Calusa craftsman enjoys the cool breezes after a summer storm, while working on a bear skin robe. The most abundant skins were of deer, which he is sitting on. I painted the steel blue-colored sky to contrast with the warm skin tones of the figure.